Why: Nuts are a great source of protein and fat. 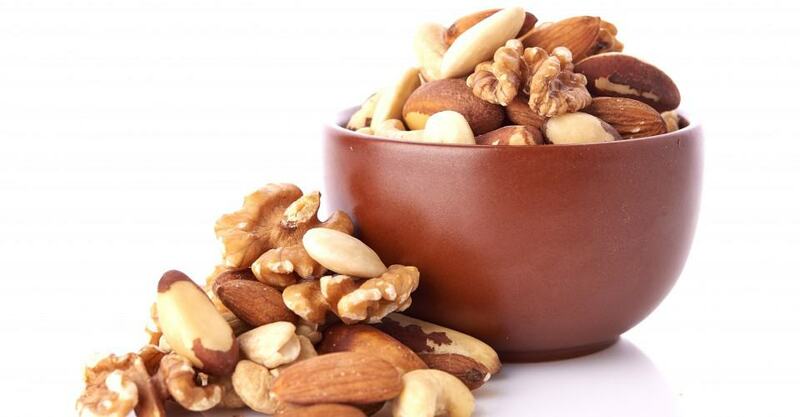 The Nurses’ #Health Study followed 86,016 nurses over the course of 14 years and found that those who ate 5 ounces or more of nuts per week reduced their risk of death from heart attack by 35 percent and were on average thinner than those who did not eat nuts. Those who ate nuts a few times per week had a significantly lower risk for developing heart disease, and those who ate nuts five times per week or more showed a greater than 50 percent risk reduction as compared to those who did not eat nuts very often. Why: Just so we’re clear, peanuts are legumes, not nuts, and they provide an impressive nutrient powerhouse — in fact, peanuts have more than 30 essential nutrients and phytonutrients. They are a good source of vitamin E, which is known to have antioxidant properties and to boost immune function, and folate, widely known for its role in reducing the risk of certain serious birth defects, such as spina bifida. They also contain niacin, which helps reduce high cholesterol, as well as magnesium, which relaxes muscles and increases metabolism. Plus, they’re low in sodium and, like any plant-based food, naturally cholesterol- and trans fat-free. Just 2 tablespoons of peanut butter have 7 grams of protein. Protein helps keep you feeling full longer. Peanut butter also contains high amounts of arginine (an amino acid that can improve blood flow) and flavonoids (a type of antioxidant that reduces inflammation and protects against cell damage). It takes 1 pound of peanuts to make 2 cups of ground peanuts, which equals 1 cup of peanut butter. Make sure to get peanut butter that is JUST ground peanuts, nothing else. Smucker’s Chunky Natural Peanut Butter is a commercial product that uses only ground peanuts. Also, you might want to try freshly ground almond butter, which is 180 calories for 2 tablespoons. Why: They’re nutrient-dense and packed with antioxidants, vitamins B6, C and E, as well as folate and potassium (60 percent more potassium per ounce than bananas), and they’re a great source of monounsaturated fat, which studies have shown to reduce serum cholesterol levels when used in place of saturated fats. Keep avocados and guacamole in your diet, but avoid the fried tortilla chips and other unhealthy foods that tag along. Serve it in small dishes for portion control, and have it with baked, low-fat chips. Also, you can use avocado slices to replace other high-calorie foods that contain saturated fat, such as whole-fat cheese, which has 100 calories per ounce. Why: In terms of the antioxidants contained in dried fruit, research published in the Journal of the American College of Nutrition reported that dried figs and dried plums (prunes) have the best nutrient score. Additionally, the researchers concluded, “Dried #fruits have a greater nutrient density, greater fiber content, increased shelf life, and significantly greater phenol antioxidant content compared to fresh fruits. The quality of the antioxidants in the processed dried fruit is the same as in the corresponding fresh fruit.” However, vitamin C, which is present in many fresh fruits, is destroyed by heat in the drying process. Dried fruit is high in fiber and carbohydrates and low in fat. It has significant antioxidant value; however, because it’s dried, its nutrients are very concentrated, and so are its calories. The allowable claim goes on to say that: “To achieve this possible benefit, olive oil is to replace a similar amount of saturated fat and not increase the total number of calories you eat in a day.” Why? Because oil has about 120 calories per tablespoon. So, if you don’t use it as a replacement, you could put on about 25 pounds in a year by following only the first part of the advice. Oh, and keep in mind that “light” olive oil does not have fewer calories – it’s just lighter in color.